As humanity progresses and turns to face the eternal black of the universe, the questions of free will and fate, of love and peace, of the riddles of time itself will arise and Germany will be called upon. But is his will strong enough, his his mind ready to breach the void and provide us with salvation? This this is the short film that has been produced to give you a brief introduction to thoughts around the cult of celebrity, one of the key concepts that is held within the novel, Concrete Operational. It is a monologue performed by Lawrence Stubbings, filmed by Ed Cook and Richard Galbraith, and edited by Ed Cook. Although Richard was the mind behind the script and words that Lawrence performed, Ed was really the powerhouse that put the production together. You can view more of Ed's work on his Vimeo Channel and follow him on Twitter as well. As humanity progresses and turns to face the eternal black of the universe, the questions of free will and fate, of love and peace, of the riddles of time itself will arise and Germany will be called upon. But is his will strong enough, is his mind ready to breach the void and provide us with salvation? Germany Germany, a man who was free, a man who loved, now an instrument in their machine. They have turned him into the very thing he hates, what he and everyone he loved fought against, the world's greatest celebrity, a tool in the subjugation of man. But the memories of freedom and love remain, and he will fight and change the course of human history for the better, but at what end? As humanity progresses and turns to face the eternal black of the universe, the questions of free will and fate, of love and peace, of the riddles of time itself will arise, and Germany will be called upon. But is his will strong enough, is his mind ready to breach the void and provide us with salvation? This book is the collection of original artwork from five artists based around some of the deepest human emotions; anger, desire, love, jealousy and madness. 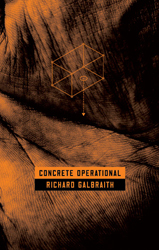 Inside you will also find the extracts from the novel that inspired them, Concrete Operational by Richard Galbraith. This Album is the collection of original music from five bands based around some of the deepest human emotions; anger, desire, love, jealousy and madness. This bespoke, hand made boxed collection includes The Novel the Art Book and The Album. It will be numbered one of two hundred made and will be shipped directly with a message from the author. These are limited edition, no more will be made. Talbot is a figurative artist, his life drawings are edgy and sometimes uncomfortable, collaborations between himself and his model. His paintings however, are pure invention.. light, movement and tension.. he’s an anatomist, inventing the figure, moving it in his head and on the canvas, visualising the movements and changes as he works, capturing light where it is, was, and where it’s going to be. While he is best known for his figurative works on canvas and paper, Talbot continues to develop and extend his body of work in other mediums, most notably his latest ‘transition’ series of litho-based monotypes. 2009 and Rue The Day continue to immerse themselves in a fervent UK metal scene; and head the charge of fresh British thrash talent. Unleashing their debut album on Casket Records in 2008 with sell out sales online, alongside glowing press coverage a full UK tour and a film soundtrack they brought their brutal sonic wave to the masses. Having toured Eastern Europe in ’08, concluding in a headline slot at the Party in the Prague Festival, Rue The Day’s music has featured on MTV 2's Headbangers Ball, a ‘history of thrash’ Big Cheese covermount CD and a number of extreme sports films. Now in 2009, they have just launched a new EP ‘Cometh the Hour’ and continue to pummel British and foreign shores with their juggernaught of thrash power. I came across Holly’s work through the brilliant It’s Nice That blog and instantly knew her watercolours and portraits were something out of the ordinary, completely unique and bursting with energy. In other words, perfect for Operation Concrete. Her work has recently been exhibited at the very awesome 93ft east in east London, and her awesome Obama portrait is in the latest issue (March 09) of War magazine, available around London. A brilliant new talent. London's Invasion are a heavy bass-less trio made up of two girls and one metal geek. They finalised their line-up in January 2007 and play short, fast, riff-based tracks with incredible vox to accompany a late 80's drunk-metal attack. Invasion released their limited 4 track debut 7" EP 'Moongazer' in the summer 2008 (Run for Your Lives) and recently recorded 12 tracks in 4 days at Toerag Studios with James Shaw from Simian Mobile Disco. Following two 10 inch releases in May and July 2009, their debut album 'The Master Alchemist' is due in September 2009 from This is Music Ltd. The instant I saw Gareth’s work I knew I wanted him involved. His black ink images create densely patterned works which forces movement around the page through shape and contrast. It’s intense and can give the impression of an optical illusion through its deep lines and stark contrasts of colour. I loved the difficulty that comes from Gareth’s work, almost having to squint to look at it properly without it hurting your mind, and perfect for some of the more intense scenes in the novel. Already working with the collaborative medium between art and short-film, his almost binary work is as appealing as it in intense and a great addition to the project. Hailing from Northampton, My First Tooth is the totally encapsulating, totally spine-tingling indie-folk creation of singer-songwriter Ross Witt and violinist Sophie Galpin. Taking influence from modern indie heroes such as Eels, Okkervil River and Neutral Milk Hotel, My First Tooth have crafted ambitious and beautiful songs aching with subtle heartbroken soul and unwittingly touching melody. An artist working mainly in acrylics on canvas she pulls inspiration from all corners but is particularly inspired by music, and when painting to music. When I read that she enjoyed collaborative work, in instantly realised her style and thought process would fit perfectly with the project. Tori frequently exhibits her work in and around London, her latest show at the very cool Brick Lane Gallery exhibited her work created over the past 3 years. Work that had been inspired by different events in her life, combined with her obsession with music. Driven by too much sugar in their diet, Akira love the noise that music makes. They say they stand for star-gazing, armed with the belief that ’popular’ and ’dumb’ do not always need to be interchangeable terms. Making their way to Cambridge University from Lagos, Brixton and Southgate, they met in a cycling accident on November 9th 2001. They decided to form a band. They spent two years writing and rehearsing before playing a single gig. They then picked up various degrees before moving to London and spending the ensuing time learning how to produce their own music, create electronic sounds and promote their own nights, forging links with like-minded bands that had nothing to do with scenes and everything to do with a kindred interest in pushing things forward. Benjy’s illustrations and etchings struck me immediately; a streak crosses straight over from innocence and simplicity to complex malevolence in a way that just draws you in. I think it was the levels of curiosity in Benjy’s work that really drew me into asking if he would like to be involved with the project. Currently studying Illustration at Brighton University going into his third and final year, his work will soon be exhibited in the Ragfactory just off Brick lane, and recently had a series of seven prints on show at the 7th International Biennial of Contemporary Prints in Liege, Belgium. A designer, font-nerd, typophile, musician with an appreciation for art and whiskey, Mike has been aware of the project from its inception and basically came to me and said, ‘If I do this, it’s going to be amazing,’ so what else could I do? We sat down, brain stormed, our ideas clicked and we went from there. So far, with thoughts ranging from sacred geometry to Moirae, the ancient Greek personifications of destiny, his ideas and creative skill in acting on them is second to none, and we have an amazing set of designs thanks to him. His portfolio site currently undergoing reconstructive surgery.